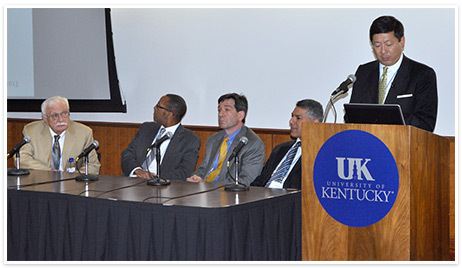 The inaugural Vision Healthcare Summit was held on May 31st, 2013 at University of Kentucky in Lexington. The idea for this conference was hatched after our Department had attempted to address changes in healthcare policy and the ever-changing environment in academic and private ophthalmology practices. We found that approaching such a complex topic through our routine teaching conferences and Grand Rounds lecture series was inadequate. Through the hard work of our faculty led by Jayakrishna Ambati, MD, Professor, Vice Chair and Director of Research and Mark Kleinman, MD, Assistant Professor in the Department of Ophthalmology and Visual Sciences at University of Kentucky, we assembled a diverse group of experts from prestigious academic departments, successful private practices, the pharmaceutical sector, and hospital and business administrations to discuss the modernization of our practices and training programs in this age of rapid healthcare policy reform. As you will experience through this online accredited CME offering, the results were astounding. It is with great pleasure that we are able to provide this rich source of learning content to you through our portal, www.cecentral.com. I certainly hope you enjoy the talks and discussions as much as I did, and that you will join us in person for future Vision Healthcare Summit meetings.